Simon & Schuster Books for Young Readers, 9780027362619, 32pp. In love with a beautiful girl, but too shy to summon the courage to tell her, a young man leaves his camp in frustration. One night he receives mystical visitors, who share a special gift with him; a gift from the birds and animals. It is a gift that tells the girl of the young man's love. With exquisitely detailed paintings and superb storytelling, Paul Goble here celebrates the magical power of nature, the richness and intricacy of Plains Indian culture, and the beauty of a legend that speaks directly to the heart. 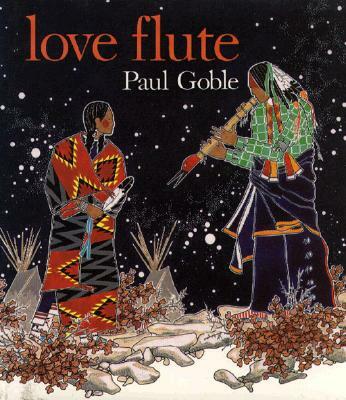 Paul Goble has received wide acclaim for his magnificent books, including Buffalo Woman, Dream Wolf, Her Seven Brothers, and the winner of the 1979 Caldecott Medal, The Girl Who Loved Wild Horses. Commenting on his work in Beyond the Ridge, Horn Book Magazine said, "striking elements synthesize the graphics with the narrative and spiritual aspects of the text." The New York Times Book Review noted that his technique is "a marriage of authentic design and contemporary artistry, and it succeeds beautifully." Paul Goble's most recent book for Bradbury Press, I Sing for the Animals, was called "a lovely, small book that movingly conveys profound belief in the goodness of creation" by Kirkus Reviews, and School Library Journal said it "fits as easily in the hand as Goble's meditations about the natural world do in the heart."